After a look at the first seven perfumes from the Spanish niche house of Ramón Monegal (see Part I), here are the seven more feminine leaning perfumes. Cherry Musk: Notes include white musc, fruit musc, Muscenone, cherry accord, strawberry, tree moss and rose. If you have a young daughter or a niece, this might be a lovely present. Fruity, musky, you know the drill… But this one is well made and smells quite a lot better than the notes suggest. On my skin, surprisingly, neither the cherry (that note can be lethal on me) or the strawberry are dominant, I get a lot of jammy rose on musk and that is actually very nice. L’Eau de Rose: Notes include rose essence, tea rose, neroli, Ultrazur, patchouli and musk. A fresh and dewy rose, light pink, not red. Uplifting, young and happy. A very pretty perfume to apply and go without a second thought, a good companion for casual days. The drydown is a soft musk with a hint of earthy patchouli, a very faint hint. A bubbly and giggling scent that makes you smile. Cuirelle: Notes include honey, Somalian incense, Indonesian patchouli, Bourbon vetiver, green cedarwood, musk, cinnamon and extract of beeswax. A honey scent that works on me! Hallelujah! Honey can go so wrong on me (like Miel de Bois) or it can be love (like Back to Black). Cuirelle is a honey scent that evokes an illusion of leather, sweet leather. Woody and spicy notes combine to create a leather drenched in golden honey. A true beauty! Lovely Day: Notes include extract of Sambac jasmine, rose extract, liquorice extract, iris, cedar, Soft ultrazor and cassis. Surely the strangest perfume in the line, Lovely Day is a gourmand that juxtaposes liquorice and cassis with a floral phalanx of jasmine and rose. Sprinkled over it like powder sugar is a soft iris note. It is appetizing and off-putting at once. Steadily swaying between lip-smackingly edible and, well – totally not, this leaves me a bit at a loss. It does smell like a bouquet of flowers covered in pink bubble gum. Kiss My Name: Notes include absolute of Indian Tuberose, iris, cedar, Absolute of Egyptian Jasmine, Tunisian neroli and tolu balsam. Here is the token white floral of the bunch, the Fracas, the Rubj, the Péché Cardinal of Ramón Monegal – his version of a diva. Opening beautifully, if a bit metallic, Kiss My Name (NOT a fortunate name in my opinion, but maybe it is only me who has expletives on her mind. ), is loud, exuberant and happy. A diva she is, although not one to play in the same league as the ones mentioned above. Her arias can be a bit tinny and screechy some days, on others she impresses with more depth than the middling performance of the day before suggested. All in all she is not totally reliable, but, as always, that perception could be the fault of the audience (me, in that case). 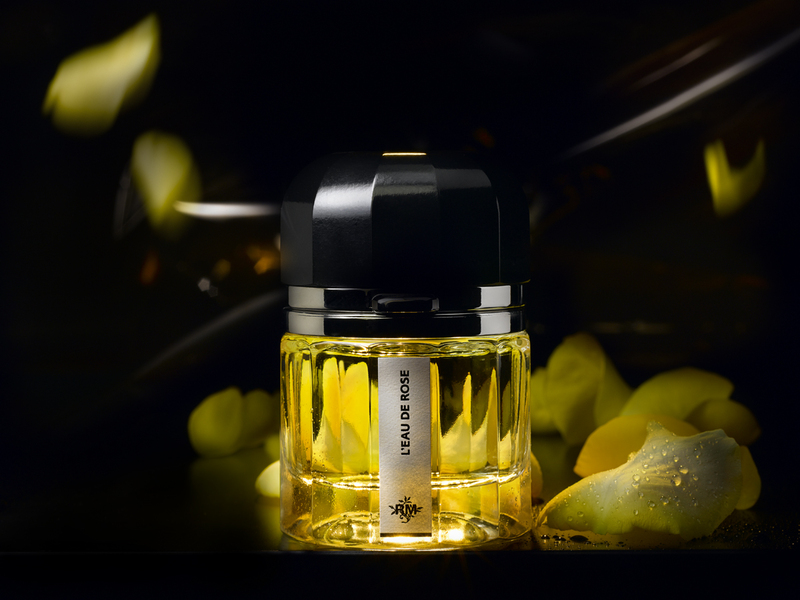 Entre Naranjos: Notes include Tunisian orange flower extract, orange, petitgrain, neroli, amber and Indonesian patchouli. A fresh and realistic orange, juicy, tart and sweet. The sparkling opening does not last though (not really a shocker, that is just what citrus does, it is a fleeting thing of beauty), and Entre Naranjos dries down to a soft woody, faintly orange-y amber. Lovely, but a short-lived pleasure. Impossible Iris: Notes include Italian iris, mimosa, raspberry, ylang-ylang, Egyptian jasmine and Virgin cedarwood. A lovely name like this raises expectations and curiosity. So what makes this iris impossible? Impossible Iris opens strong and rooty, the dusky, dusty, earthy, carroty iris root complemented by the slightly harsh, raspy aura of mimosa. Over time it quiets down, becomes smoother, softer, more elegant and refined, raspberry gives a surprisingly lovely pink hue to to the perfume, ylang-ylang softens it further and adds a creaminess the opening was lacking. A half hour into wearing Impossible Iris, I am entirely happy with it. Buttery smooth, soft, elegant and lady-like, this iris is anything but impossible. It is incredible. So, after testing fourteen new perfumes, I’m a bit exhausted. I think to launch with such a big number is a bit much. Generally I prefer a new brand to start small and giving the perfumes a chance to establish themselves before expanding. I like the way Vero Profumo or Neela Vermeire Creations have done it. But that said, Ramón Monegal is a solid line with many very good perfumes and only a few duds. I’m curious to hear your thoughts. Do you like to have many choices within a line right from the start? Or is it just too much and the perfumes are cancelling out each others chances for long-term survival? Are you going to try Ramón Monegal? This entry was posted in Amber, Chypre, Citrus, Floral, Fragrance Reviews, Fruity, Gourmand, Honey, Incense, Iris, Jasmine, Leather, Mimosa, Musk, Orange Blossom, Oriental, Patchouli, Ramon Monegal, Resins, Rose, Tuberose, Vanilla, Woods and tagged Amber, citrus, floral, Fragrance, Gourmand, Honey, Incense, Iris, Jasmine, Leather, Musk, Oriental, Perfume, Ramon Monegal, Review, Rose, Tuberose, Vanilla, woody. Bookmark the permalink. When I saw the name Kiss My Name, my first thought was “Kiss My Grits!” Actually, it was more like, “Kiss My Grits, Foo!” but I thought I should leave the extra slang word out 😉 Not that I am for focus groups when it comes to fragrance, but surely someone could have asked around because sticking these poor perfumes with such unfortunate names (XXY, I’m looking at you!). That being said, I am now very curious about the line. Cherry is difficult to pull off, or maybe it’s just that every cherry fragrance I’ve tried smells like cough syrup on me. Or lambic. Which might as well be cough syrup. So a good one definitely piques my interest! Oftentimes, when there are a lot of perfumes in a line, I get very overwhelmed. So I definitely applaud you for reviewing all 14 of these for us! It definitely takes a dedicated nose and I am very impressed by your commitment. This cherry is really nice, it is a notoriously difficult note. It took me a good while to test them all, but it was fun. Oh I would not know where to begin with 14 perfumes! If I bump into them I will have a smell or two or fourteen, but unless there is a sample set readily available, I probably won’t seek them out. That being said, the amber perfume sounds interesting. Thank you for taking on the task of reviewing these perfumes! Exactly! Start with three and people won’t be overwhelmed. A set is absolutely necessary if there are so many. Though, if there will be a reasonably priced sample/discovery set I’ll go for it. I love your business model, Undina! But seeing as it is like it is, let’s hope for that sample set. Hm, a bit overwhelming with 14. And brave. The flowers with bubblegum will be in my luckyscent summer pack (hm, I would be happier with the Iris or Cuirelle, but never mind). I saw Lovely Day in that summer sample pack, so that’s a good sign that the line will be at luckyscent soon. 14 is overwhelming which is no doubt why you split them into 2 posts. The problem for me is that it’s hard to keep so many scents from one new line in mind, so when I come across them I’m unlikely to be able to remember which ones I liked the sound of and just pass them all by. With 3, even if you can’t remember them clearly you’ll try them all because it’s easy to hold on to your impressions. Having said that, I very much like the sound of Cuirelle because a leather honey perfume sounds so unusual. Let’s hope I can remember it when I come across all 14 one day! I tend to pass on lines that offer rows and rows of different choices, which is why I have largely ignored lines like Profvmo or Montale, so I know how you feel. 14 is just too many, I agree with Undinas model here. Anything up to 6 I think is fine, but above that, I’ll just give up and choose another brand for exploration. The bottles are gorgeous. Now that you remind me, Cherry Musc is a bit reminiscent of LPRN. Cuirelle sounds made for you. I think I have to come to the defense of Ramón Monegal here 🙂 As I have understand it, RM started up his own perfumehouse and shop a few years ago (2009) locally in Barcelona and has released the creations there subsequently. Now the house takes the next step, launching global and I suspect that if the collection avaible locally haven’t been released as a whole also worldwide, there would have been complaints regarding that strategy too. To me 14 isn’t too many as there is no obligation to test and evaluate all of them at once. An alternative approach that I find usable to understand and reflect over a perfumeline, is to test two to four at a time, evaluating one fragrance per (at least) one day during some nearby days, waiting for a while then testing a few others and so on. To have samples of the whole line within reach is IMHO a great advantage as one can arranges to test fragrances in similar subgroups of the line at different times. This is of course my subjective method testing out and learning about a house, everyone have to find hers/his own way. You are right of course, the perfumer didn’t come up with those 14 scents over night. When I’m critizing the launch volume, I do it not out of spite, but because I fear the individual perfumes can’t be appreciated, since many people feel overwhelmed, as this comment thread shows. Similar to what Parfumista said above, after reading an interview with the perfumer over at Carrie’s Eyeliner on a Cat blog, I got the impression that he has been in business for a while and has built up to having 14 fragrances in his catalog. But for his global launch that does present a daunting number of perfumes for the mind to take in. Histoires de Parfums was similar; even though they sent a discovery set, I remember thinking that was a lot of perfumes to sift through, and I rather prefer being presented with a smaller number of perfumes that the perfumer might consider his absolute best. But to each his own, and HdP seemed to do okay with launching a bunch at once, so hopefully Ramon Monegal will too. Of the fragrances you reviewed today, the one that I think has my name on it is Cuirelle … I love a good honey note, and along with those other notes that accompany it to create an impression of leather, it sounds ridiculously good. Of the fourteen, which was your absolute favorite, Birgit? I think I’d go for Mon Patchouli, if I have to choose. But Cuirelle is a close second. All that sniffing! Your nose must be worn out! Great review! Ah, well, I do it one at a time. 😉 Thank you, Lanier! Holy sweet! These look right up my alley. Either some risque blind buying or impatient and unlikely sampling will have to be done. The bottles are a winner for me. yum! Interesting and hefty by the look. Wow, to release 14 fragrances is quite a feat… although it makes you wonder how much time and effort has been spent on each scent. Thanks for reviewing them. I don’t know if I will sample any of them… maybe in a couple of months if more blogs write about this line. At the moment I have 13 Parfumerie G. samples waiting for me. Ramon Monegal has been a successful perfumer for decades, and has established his own brand in Spain over the past years, so these 14 perfumes didn’t come into being overnight. But they want to launch internationally now and chose to present them all at once.